Tampa Bay Rays starting pitcher David Price was named the American League Cy Young Award in a razor-thin result on Wednesday evening, while New York Mets knuckleballer R.A. Dickey was a clearcut winner of the honour in the National League. 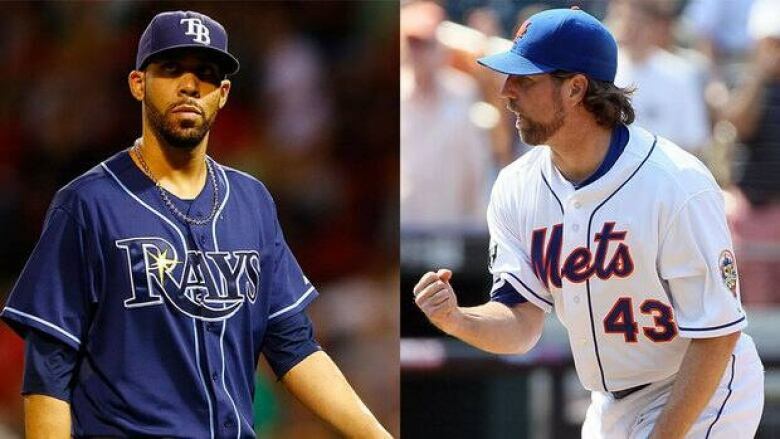 Tampa Bay Rays starting pitcher David Price was named the American League Cy Young Award winner in a razor-thin result on Wednesday evening, while New York Mets knuckleballer R.A. Dickey was a clearcut winner of the honour in the National League. In the second closest race in the history of the AL award, Price narrowly edged out Tigers' ace Justin Verlander with 14 of 28 first-place votes and a total of 153 points in balloting by the Baseball Writers' Association of America. Verlander was selected first on 13 ballots and finished with a total of 149 points. Price went 20-5 to tie Jered Weaver for tops in the AL in victories and winning percentage. The 27-year-old lefty had the lowest ERA at 2.56 and finished sixth in strikeouts with 205 in 31 starts for the Rays. Posting a 19-6 record with a 2.72 ERA in 2010, he was a runner-up for the award, finishing a distant second to Seattle Mariners' Felix Hernandez. Moments after the announcement, Price tweeted: "YESSS!!!! Thank you everyone!!! Thanks #BBWA for voting for me!!!! THANK YOU TEAMMATES I love you all!!!! #raysnationstandup." Verlander, the AL's Cy Young winner and MVP a year ago, followed that up by going 17-8 with a 2.64 ERA and pitching Detroit to the World Series. He led the majors in strikeouts (239), innings (238 1-3) and complete games (six). He also commented on Twitter: "Congrats to @DAVIDprice14 on Cy Young!" One factor that might have swung some votes, however: Price faced stiffer competition in the rugged AL East than Verlander did in the AL Central. "I guess it's a blessing and a curse at the same time," Price said. "There's not an easy out in the lineups every game. It feels like a post-season game." The 1969 tie between Mike Cuellar and Denny McLain remains the tightest race in the history of the AL award. The other nominee, Weaver of the Los Angeles Angels, received 70 votes. Rays closer Fernando Rodney got the other first-place vote and came in fifth. In the National League, the race was nowhere near as close. The 38-year-old R.A. Dickey took 27 of 32 first-place votes with a total of 209 points. The Mets' knuckleballer posted a 20-6 record with a 2.73 ERA and a league-high 230 strikeouts in 33 starts. "I am not a self-made man by any stretch of the imagination," Dickey said on MLB Network. "This is a victory for all of us." Dickey joined Dwight Gooden (1985) and three-time winner Tom Seaver as the only Mets pitchers to win the award. The right-hander was the club's first 20-game winner since Frank Viola in 1990. And perhaps most impressive, Dickey did it during a season when the fourth-place Mets finished 74-88. "It just feels good all over," he said. Clayton Kershaw of the Los Angeles Dodgers was seeking to repeat as the league's top pitcher, but received just two first-place votes and 96 total points. On Wednesday night he posted on Twitter: "Congratulations to @radickey43 and @davidprice14 on winning the Cy Young. Happy for u guys! Thanks to everybody for their support." The other NL nominee Gio Gonzalez of the Washington Nationals received only one first-place vote and 93 total points. On Monday, Washington's outfielder Bryce Harper won the National League rookie of the year, while Los Angeles Angels outfielder Mike Trout took home the American League rookie of the year honours. Then on Tuesday, Davey Johnson got the nod as the NL manager of the year and Oakland's Bob Melvin was named AL manager of the year. The AL and NL MVP awards will be awarded on Thursday.